ADAMA, a sixteen-year-old Muslim American who was abruptly seized from her home by the FBI on suspicion of being a suicide bomber. Even after her release from detention, she was forced to wear a tracking bracelet for the next three years. Click here for an excerpt of Adama’s story. TALAT, the mother of 9/11 first responder Salman Hamdani, who went missing after the attacks. As Talat and her husband searched desperately for their son, they were hounded by the media, who portrayed Salman as a possible terrorist in hiding. RANA, a Sikh man whose brother Balbir was gunned down outside the gas station where he worked. Balbir’s death was the first reported hate murder after 9/11. 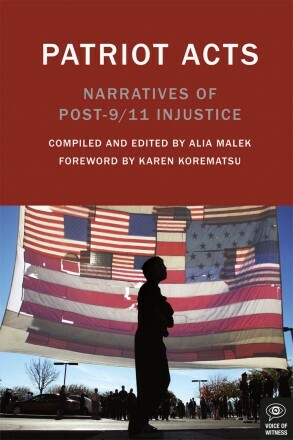 Alia Malek is an author and a civil rights lawyer. Born in Baltimore to Syrian immigrant parents, her reportage has appeared in The New York Times, The Nation, Salon, The Christian Science Monitor, The Columbia Journalism Review, and WashingtonPost.com. Her first book was A Country Called Amreeka. Click HERE to purchase the book from McSweeney’s. Tagged 9/11, alia malek, mcsweenys, patriot acts, voice of witness.